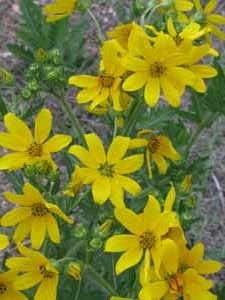 April means wildflowers in central Texas. For many locals that calls for a day trip into the countryside following routes noted for spectacular sightings. But just as folks go to Washington D.C. in the spring to see pink cherry blossoms and journey to New England for autumn leaf peeping, intrepid travelers head south to see the annual burst of bloom along Texas roadways. 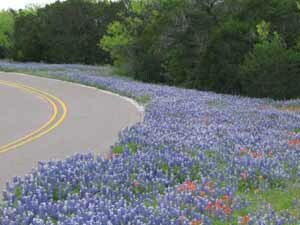 Bluebonnets, the state flower, dominate landscapes in an endless sea of royal beauty. Unbroken fields of flowers transform rocky soil dotted with cacti into an absolute wonderland of color. 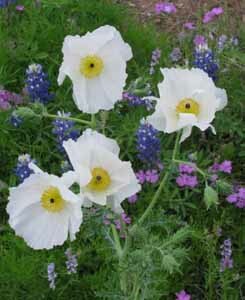 Throughout the hills and valleys a large variety of wildflowers emerge: pink spiderwort and evening primrose, red Indian paintbrush, burgundy claret cup, purple prairie verbena, yellow daisy, and white prickly poppy. 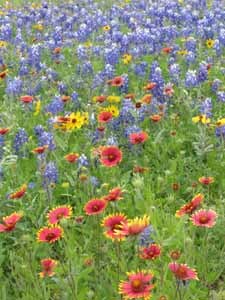 Indian blanket, coneflowers, and Mexican hat add yellow-tipped red petals while Texas lantana grows wild in a rainbow of hues. While Mother Nature is the main force behind this awesome treat, today many of the wildflower meadows are manmade—seeds are sown and allowed to grow undisturbed in fields. 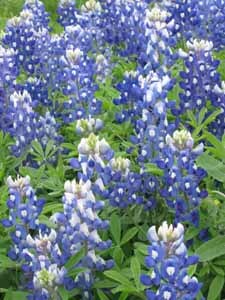 The Texas Department of Transportation, encouraged by former First Lady Lady Bird Johnson, broadcasts bluebonnet seeds along numerous highways. Still, flower displays are at the mercy of the weather, determined by temperatures and rain during the fall. All the conditions were just right in 2010 for the most outstanding show in a decade. Here’s a recap of our wildflower drive from last year that provided many glorious sightings and gorgeous photos. Prime color is still a few weeks away for 2011, but this route won’t disappoint. From Austin, we headed west via State Highway 71, passing the communities of Bee Cave and Spicewood on the way to Marble Falls. We veered off onto Hwy 2147 to Lake LBJ, one of the Highland lakes, and Horseshoe Bay, where lovely fields of yellow flowers surround huge oak trees. Then we backtracked to Marble Falls. If it had been lunch time, we would have stopped at the Bluebonnet Cafe, famous since 1929 for its yummy homemade pies and home-cooked meals. We parked just before the city limits to marvel at a gorgeous conglomerate of flowers right beside the road. 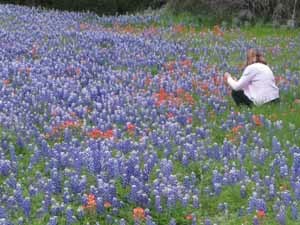 Next, we headed towards Burnet on SH 281 but turned off on Park Road 4 to Longhorn Caverns, another spot that rewarded us with plentiful blooms dominated by bluebonnets. If you’re into caves, this is a cool one to visit. Back on our wildflower drive, we took RR 2341 toward Canyon of the Eagles on the shores of Lake Buchanan, and then returned to Hwy 29, which goes through Llano, where you can get some of the best old-time pit barbeque ever at Cooper’s. Then we headed south on 2323, stopping often to hop out of the car and stoop low for the best photos. Halfway to the German community of Fredericksburg we detoured at the old Prairie Mountain schoolhouse for more dazzling pictures of wildflower fields. By the time we arrived in Fredericksburg it was too dark for photos, so we grabbed a quick meal and headed back to Austin on State Highway 290. Contrary to popular belief, it is not against the law to pick bluebonnets—but it is against the law to trespass, so tread carefully. Wherever you decide to drive, take time to enjoy the beauty that only Nature can provide. Also read Texas Hill Country in Spring by Elizabeth Rose. 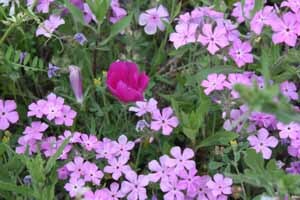 You'll have to look harder to find wildflowers this year, so be sure to check Internet sites for places where various flowers have been spotted.